As a Mother I never want to push my own issues on to my children. Lately, with my 3 year old, I'm struggling with that. 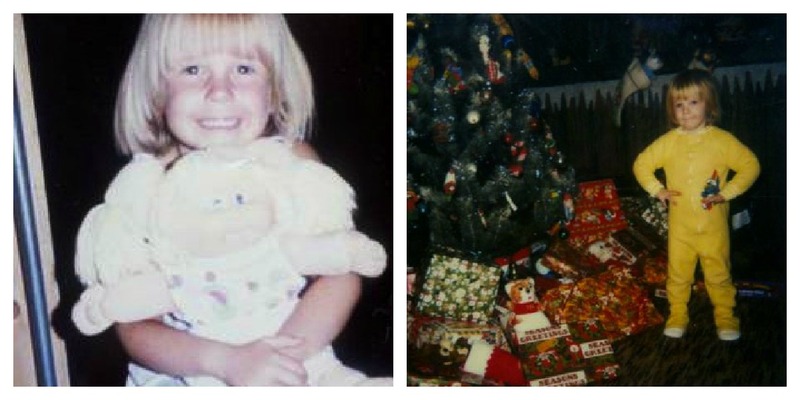 As a child I think I was pretty normal, I was active, I don't remember eating a lot of junk, I was not overweight. At her 3 year check up she was in the 95% percentile for weight and height, her Dr was slightly concerned but said that kids usually start thinning out around 4 or 5. That didn't stop me from being concerned. I started this healthily journey after I had Miss M not only for myself, but for her. I don't want her to struggle. I want to be a good example for her. Things have been slipping, she's getting picky and demanding to only eat what she wants to eat. I give into her too much. I'm not perfect and I have very little patience especially at the end of a long day of being a Mom. I dont' know how to MAKE her eat what I want her to eat, she'll just not eat at all. *warning another super embarrassing picture! 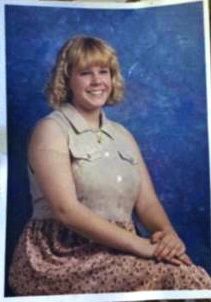 This is me at 14. We had just moved from Ohio to Texas, I was a bratty teenager and I was very unhappy. I ate my feelings, usually with a pan full of brownies. I vividly remember being depressed about how I looked, my teenage years were not fun, for me or my family. I want to spare my daughter this pain, so it needs to start now, which is why I've thrown away not only my junk, but hers too. No more snacks of Cheez it's. No more waffles for breakfast. I tried to get her excited about a smoothie, even letting her run the blender, but she drank like 4 sips. It takes time to build new habits. What things do you guys use to keep your kids healthy? Good for you! Leading by example is the way to go...Also, you are totally in charge of her food still. She's three. It's so tricky. I remember sneaking food around the age of 4...started early for me. I'm struggling with this with my oldest daughter. I don't want her to have an eating disorder or worry about her weight at 10 but I don't want her to be big like I always have been either. 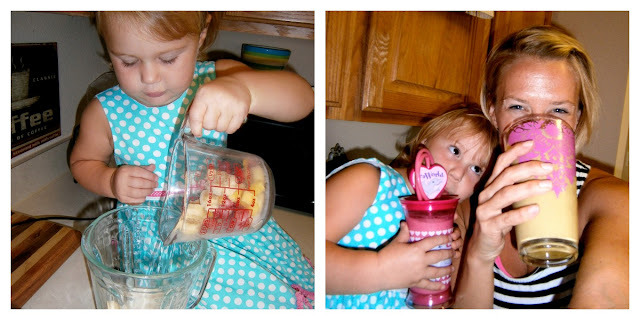 My kids love fruit smoothies and they actually eat quite a few veggies. We just eat a lot of frozen pizza and chicken nuggest on nights we are lazy or have somewhere to be. I know this needs to stop but they are picky also. The worst thing is my husband is pickier than they are and if he can have something other than what I'm having they don't see any reason they can't. I'm trying to tell him it starts with him but I get, "I'm not the one worried about my weight." His family has A LOT of over weight people and mine has their fair share too so I try to explain to the girls that good eating habits need to start now without saying, "Do you want to always be the fat friend like mom?" or "You'll worry about it once you're trying on prom dresses." It's such a fine line and I get in trouble with my family the instant I try to address it. I don't know what to do. My nephew is 10 and 142 pounds and they are just NOW seeing the problem with this. Poor kid stopped drinking pop for a few days and was depressed because the scale isn't moving and his clothes aren't loose. This is a whole other can of worms but yeah, let me know how you get this to work without hard feelings. It's so hard! Our dr has always said to make one meal at each mealtime. Toddlers will eat when they are hungry they won't starve themselves. She may not eat much at a particular meal, but will more than likely eat more at the next meal. There are plenty of times my girls ate maybe 2 bites of dinne and that was it, but they've learned if they are hungry they better eat what's offered! It will take some time and not giving in :) good luck!! I totally know what you mean! I'm trying to do the same thing with my daughter. And it helps a lot only having healthy options available. One day at a time and I keep telling myself that her seeing me eat healthy and exercising will help in the long run too. Kee up the good work! I am so glad you posted this. I've always struggeld with my weight, as a teen and an adult. I have a two year old son who was off the charts at birth (11.2 lbs) and continues to be off the charts. He's just a very big, stout little boy, however I can see this becoming a problem in his future and I want to curb it now. I struggle with healthy food choices everyday and sometimes laziness gets the better of me especially when I've had a really rough day and frozen pizza is available. I try to remember that making good habits now will carry into the future, but it's so hard when your child doesn't eat what you serve and the old phrase "you eat what I serve or don't eat at all" doesn't apply at my house. When you find healthy toddler choices please share on the blog because I'm sure a ton of other moms struggle with this same issue. Keep up the good work! and OMG! That's the Megan that I met a billion years ago! Where is the silver lipstick? This is something that I have struggled with my oldest daughter as well. She started chubbing up when she was about 2 or 3 and has been overweight her entire life (she's now 16). Good for you for recognizing this early and making a change for you and your daughter. I'm sure it will be much easier starting young than to have to go back and change bad habits when she's older. i don't worry a ton about the food with my kids- what i stress is that they are active.... i think everything in moderation is ok and i don't want them to obsess over food (like i did!) so i try to put the emphasis on leading an active balanced life. fingers crossed it works! There are a lot of good books out there for "sneaking"veggies into snacks and meals - one that worked for us most of the time was spreading pureed sweet potato or avocado on a grilled cheese. Another thing I do alot is mix in a bunch of different veggies into their spaghetti (shreded or diced really small so it goes undetected). Also, you can make your own healthy fruit roll ups. My 22 month old twins will pretty much always eat yogurt (I get either plain greek yogurt and make my own fruit purees to stir into it, or I buy the Chiboni Champions greek yogurt for kids), they love cheese in any form, and they also love strawberries and avocados. Mine will usually snack on raisens, bananas, a spoonful of natural peanut butter, almonds or any other kind of mixed nuts (unsalted), and they love popcorn (I just buy the bag of kernals and put a handful in a paper bag and pop it in the microwave for about 2 min). Anyways, hope this helps. I have always tried to be very vigilent about what my kids eat, and they still go through phases and will be picky - so don't be so hard on yourself. I've noticed my kids starting to add on the pounds as well. my son had failure to thrive as a baby so we were very excited at the gain at first, now I'm a little worried he will swing in the opposite direction. I've been giving more fruit snacks (apple slices, carrots with a small amount of ranch, grapes, etc) instead of crackers and cookies. My kids love fruit so they don't really complain. I still give them sweets and crackers, but I'm trying to be more mindful of what I'm giving them. We do like the Deceptively Delicious cook book that Kate mentions, we also do lots of smoothies for breakfast with spinach leaves and carrots and use water instead of juice. I don't know if you get Parents Magazine, but there was just a huge article in the August issue about child obesity (not that Miss M is) but they have tips in there on what to do about picky eaters and stuff. It did mention that for children that won't eat their healthy dinner, and then ask for a snack before bed, you should just put their dinner in the fridge, and when they ask for a snack later, re-offer them their dinner. Anyway, hope it helps. ALSO....since she is 3, start getting her involved in sports! The Y has Itty Bitty sports like soccer and kickball (Hell Ya!) for 3-5 year olds. Also, lots of 5K's have a kids run as well, so maybe sign up for more 5K's where Miss M can do the kids run as well and start kindling that fire for running! I struggle with this too. I was an overweight kid, my husband wasn't. I have issues with food and it's not fun. I wouldn't wish it on my enemy. I have four daughters and am praying they don't waste years and years being super sensitive and self conscious. The competiveness between the four of them and comparing bodies has already started and they are all under the age of 7. Being a woman is hard! The area I struggle with is that I'm a stay at home mom and my husband works a lot. Their eating habits "fall" on me. My girls aren't super overweight but 2 have little bellies. I feel guilt associated with that because it's my "job". I try to be more conscious of what were eating while also instilling in them that they are perfect just the way they are - just the way god made them. Sorry for the novel...just wanted to say, I feel you! I worry about Lily too. I started putting on weight after I met my husband and after having Lily. She's skinny but some days I'm afraid she'll end up like the majority of the women in my family. However, I do have some hints that I've noticed and done myself... Don't buy the junk food. This obviously works for adults and kids. We are trying to eat really healthy and watch everything we eat (not just for fats but caramel coloring, high fructose corn syrup, so on) and so junk food doesn't really come in our house. Oreos are an exception. ;-) But honestly, try not to buy it. It'll be hard on her for a little bit and Lily will ask about something and I just say "oh, you ate it all and we don't have anymore" then say something about getting it later, but never do (or hardly ever). Lily, luckily, loves fruits and milk but she's not huge on veggies yet and does like her cheesy popcorn. I limit that and make her try everything on her plate. I do put everything we eat on her plate but maybe only one or two pieces. My rule is that if she doesn't want to eat her protein (chicken mainly for her), I tell her she has to eat three bites. I cut them small, so 3 is nothing. I tell her she has to eat them or else no ... and you fill in the blank. I don't force her to eat everything because I know that can cause trouble later on. We also limit juices to all natural, no sugar added ones. You'll be amazed at the changes and they taste the same or better!! Read the labels on many foods... applesauce for one is a big one that you can by all natural, no sugar added, and it still tastes good. It's a really hard job to go shopping and eat healthy but within a budget. But sometimes I have to decide and food is an area I try not to skimp on. Good luck. You're doing a great job by dealing with this early and not when she's 15. What if you and her went for walks in the evening? I look forward to starting that with Lily once the weather cools down a bit. This is something I struggle with my step daughter. She is average size and isn't heavy, but she is extremely picky and will only eat items with CHEESE and lots of it as well as sugar. I am afraid it will catch up with her one of these days. I don't know, I am in the same boat on this one. When I started eating clean I made the entire family do it too. My oldest child is the only one who complained because she is so picky. The other two girls (ages 4 and 1 at that time) didn't care and to this day will eat pretty much anything that I give them. One idea is to put food on skewers. It sounds crazy but kids love food on a stick. Tomatoes and cucumbers, fruit skewers dipped in greek yogurt, peppers, onions and zucchini, etc. My 6 year old LOVES when I make veggie skewers. One clean staple in our house is popcorn--we always have popcorn. I usually try to have at least one treat a week for them (frozen fruit bars, clean muffins or cookies, etc). You are inspiring me to get back on track with my clean eating! omg with the make up! 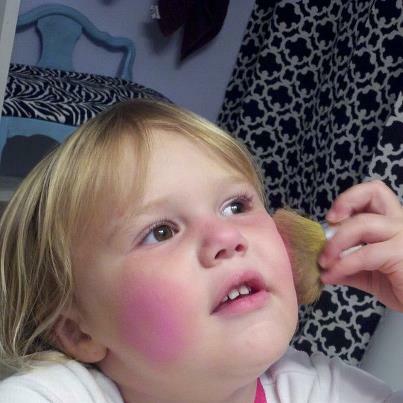 my three year asks me all the time if she can use my makeup. I've debated whether or not i should go out and get some hypoallergenic makeup of her own because she has sensitive skin. Just for her to play dress up not so she can go out all made up. as far as getting her to eat healthy we got lucky because she is completely unlike my husband or myself in that she loves all things vegetable...my son on the other hand, sigh. I worry that our kids will struggle with weight like the hubs and I do... Even both our families do. I think the key is to be INTENTIONAL, which is exactly what I think you are doing!!! Keep at it!!! She'll thank you later!!! It's better to start now than later when it will just get harder. My kids ate cauliflower mash the other day! They thought they were mashed potatoes. I googled a recipe & I threw in one potato to kind of smooth it and because I was scared they wouldn't eat it.